As promised, while our just giving page is still active we’re posting regular updates on where your money goes, so here is your next installment! Grace is a 6 year old female miniature Shetland pony. Grace came in to the rescue as her previous owner purchased her for breeding, but for one reason or another Grace would not take and as she was now considered “surplus to requirements” she came in to the rescue. As we do with all new animals, Grace had a full MOT from the vet where it was discovered that she had a condition call a “slipping stifle”, which is where the knee cap flicks out of place. Luckily for Grace, this can be controlled by keeping her fit and making sure she doesn’t get too podgy! During her assessment period, living in a field was having a huge impact on her condition: the lack of exercise was causing the muscles around her joint to become lax, making the joint even more unstable. Her initial check-up also flagged up her terrible teeth! Miniature Shetlands are known for having dental issues as they have a small head but relatively large teeth, causing overcrowding and making it difficult for her to eat. Grace has awful overcrowding in the front and she has two loose teeth at the back (also sadly common with Miniature Shetlands). Grace now requires dental check-ups every 6 months to make sure that she has no sharp edges and that she has no infection around the wobbly teeth. Her check-ups and dental work costs around £150 every time they are done, but they’re vital to keeping her healthy. If you’ve never seen it then horse dentistry can be really surprising! It still always amazes me that they’re not bothered by having an electric tooth-file in their mouth! As you can see in this video: nobody is holding grace, she is mildly sedated but standing well by herself! 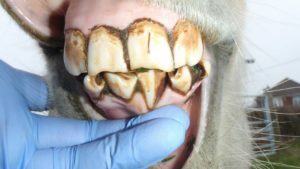 Horses’ teeth are vital to their well-being; cats and dogs can manage really well without teeth but horses really can’t. 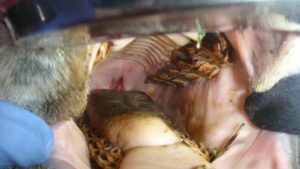 Horses’ teeth are very different to ours and really hard to fix if allowed to get bad, this short video explains how a horse’s mouth works and the importance of dental care. Unfortunately for Grace, we were really worried about her re-homing prospects and after a discussion we decided that Grace would become a permanent resident at the rescue. Luckily, I’m a New Forest Commoner (which means that I can graze my ponies on the New Forest) and roaming the forest is the perfect environment for both of her conditions: because of the large area she has to wander and the natural diet she keeps fits as a fiddle, the perfect weight and the rough forage helps to keep her teeth properly worn. Your support directly helps to keep Grace healthy and happy! The funds you donate pay for vital dental work and for the farrier to make sure her feet stay in good condition so she is able to power-walk around the forest and keep her little legs muscled up! Thank you! If you would like to donate to help us with Grace and all the other animals then please click on the Support Grace link below!